Here in the UK, today is Remembrance Day, the day that honors the end of World War I. This Remembrance Day is particularly noteworthy, as it marks the one hundredth anniversary of Armistice Day. One hundred years ago today, the Great War, the war — it was then hoped — to end all wars, came to a merciful end, but not before over a quarter of the male population of Europe was killed and many more permanently disabled (mentally or physically) — and the entire sociopolitical landscape of Europe forever altered. So much of what has happened in the hundred years since November 11, 1918, can be traced to that war — from the rise of Hitler even to our current state of global affairs. . . including the creation of the European Union and the devolution of Brexit down to yesterday’s news — a globally-disliked nationalistic “America First” US president, who flies to Europe to mark this anniversary, but then does not show up at the memorial attended by the Canadian, French and German leaders because it is “too rainy”. When I was in college, my area of study was this era — the first 25 years of the twentieth century in European and art history. I was fascinated by the idea that the entire planet can change based on small events and individual decisions that accumulate until they eventually become globally cataclysmic. It made me realize that each of us are complicit in shaping our world — whether we feel powerful or inconsequential. It is how we choose to live our lives as individuals — the beliefs we hold, the attitudes we express toward one another — that create the future. Honoring Remembrance Day, as I learned almost a quarter century ago during an hour long very detailed and incredibly interesting “lecture” over tea from the actor Christopher Lee on the importance of remembering how World War I changed the world, is part of our individual responsibility to our planet. I had learned through my studies about how the decisions made by world leaders following Armistice Day in 1918 had created an untenable situation in Germany — one that led to a sense of political and personal degradation, economic inflation, and ultimately nationalistic anger. All of that led to the rise of fascism and eventually to World War II. When that global conflagration came to an end in 1945, it was hoped that the lessons learned from the World War I reparations would influence betters decisions made by world leaders. Almost 75 years later, we are still living forward those decisions. 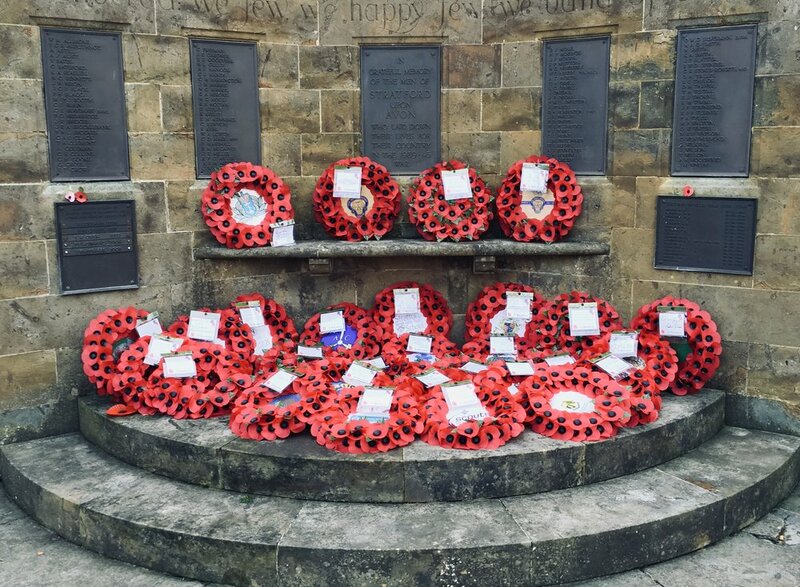 In the weeks leading up to Remembrance Day here in the UK, people wear paper or crocheted bright red poppies on their jackets and lay out memorial wreaths all over the country. When I first started coming to the UK — and for some reason I am often here in early November — I saw almost everyone wearing them. This year I noticed fewer and fewer people wearing them — and almost no young people. Although I am in my fifties, for me, the Great War is only one generation removed. My grandfather, Captain Reginald Grant, fought in the war, even surviving one of its most famous battles at Gallipoli. My mother was born during the war in Wales, while her father was away fighting — and many of the decisions that her family made after the war came as a result of what happened in the United Kingdom and in their own lives as a result of the War. It doesn’t take much for me to see the link between Armistice Day and my existence. Just as it doesn’t take much for me to see the link between the events of one hundred years ago and the state of the world as we live in it now. That thread of connection from my own life to the past events of our world was first illuminated for me when I was an exchange student in Germany in 1978 at age sixteen. A girl in our class was organizing a remembrance day to mark the fortieth anniversary of Kristallnacht — the night that the Nazis looted and destroyed Jewish synagogues and businesses, the night that the German agenda of anti-Semitism was writ large for all the world to see. Did the world see it? Yes. . .and no. For many years after 1938, the world tried to look the other way hoping that things weren’t as bad as they seemed. My classmate was the daughter of a preacher, and she asked us to ask everyone we knew to come to her father’s church for a non-denominational ceremony remember this horrible day in German history. As we began asking people to attend, I noticed a great reluctance on the part of older people to join in. The young people were all for remembering this horrible event in German history, because remembering, we believed, meant that we were ensuring it could never happen again. But for the older people who had lived through the war, they wanted to forget it had ever happened. That evening, as we listened to speakers and saw horrible visual reminders of Germany’s violent and murderous Nazi past, the message came through to me loud and clear. It is only by remembering our past that we can create a new kind of future. It came through to many young people in Germany — and it is those young people who evolved into today’s leaders in Germany, who have tried to use their country’s shameful past to create a newly progressive future. Another forty more years have passed since I attended that ceremony. Another seventy years ago this month since Kristallnacht — and anti-Semitism is once again on the rise around the globe. In the United States, anti-Semitic hate crimes have risen at alarming rates and in recent weeks a horrendous massacre happened at a synagogue in Pittsburgh during a worship service. Anti-Semitism is not the only kind of senseless hatred on the rise. The hatred of immigrants, people of color, people of different sexual or gender identities — it would seem we have all been given permission to fear and hate one another. The world seems one again increasingly divided. It would seem we have all forgotten the lessons of our past.. It is up to each of us to take up their quarrel with the foe of those who have fought and died for freedom and for peace and for a better world. But in taking up that foe, there is only one thing to remember: Our foe is always and only fear. Fear takes many forms, but it is fear that leads to hate and to war. So the only way we can “take up that battle” is not by battling at all — because the only antidote to fear is Love. The only way we can remember the past and not re-enact it is to love more. To look at everyone — and I mean everyone — whom we fear or dislike or judge, and learn to see them through the eyes of love . . . even those people we fear are our enemies or that we believe may be leading the world to ruin. War can never be won. Hatred can never destroy our capacity to love. Love can always overcome fear. But not if we don’t remember our past and refuse to reenact it.